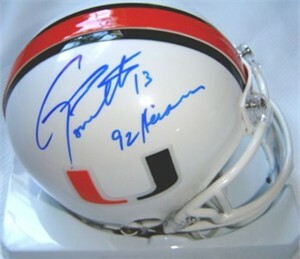 Miami Hurricanes mini helmet autographed and inscribed 92 Heisman by 1992 Heisman Trophy winner Gino Torretta. Authenticated by TriStar Productions, with their numbered hologram on the helmet and certificate of authenticity from AutographsForSale.com. ONLY 2 LEFT.